This amazing piece is actually a cover-up, but hopefully no one will ever even know. 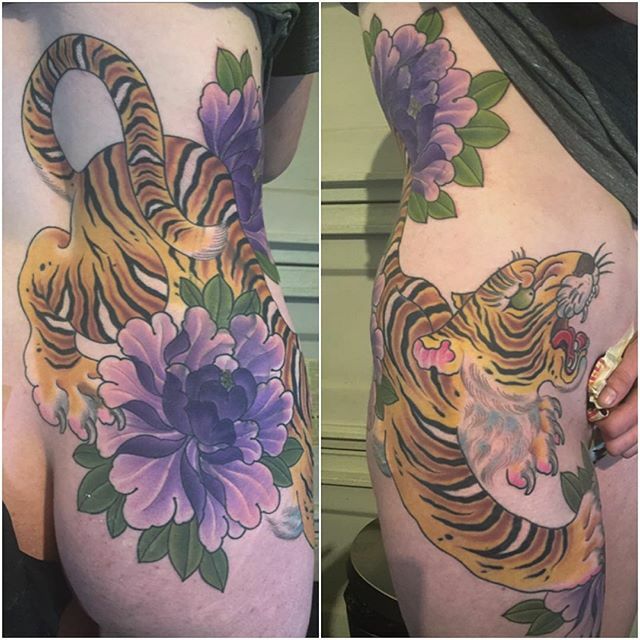 Tattoo and Artwork for Tiger and Peonies Side Piece by the new guy – Alessio Ricci. I started to tattoo in 1998 in my hometown Florence, Italy, taught by my mentor Maurizio Fiorini, the oldest italian tattooer. I’m among many other people out there that owe him thanks for giving me the opportunity to learn by working in his shop. After a few years I moved to the U.S to gain experience and knowledge about tattooing. My first step in America was in New York, and a little over a year later I moved to San Diego, California, where I live now! After working in a few shops I finally found my base, at ”Avalon Tattoo 2”, where I was at from 2006 until recently joining the Remington team. I’m fortunate to be working with many talented artists that have helped me to develop my skills and vision as a tattooist. I hope to continue tattooing until my hands and eyes fail me.